It was a saloon. But its owner, Peter Becker, sometimes referred to it as a “resort,” or “drinking resort,” in newspaper ads. It turns out, in looking at newspapers of the late 19th and early 20th centuries, that the word “resort” would sometimes be used for saloons and restaurants, perhaps to convey the image of a place where patrons could relax, drink and eat in peace and comfort. An early ad for the place, in the San Diego Evening Tribune on February 20, 1896, , was pretty basic: “Fine Wines, Liquors and Segars. Hot Lunch forenoon. Steam and lager beer on draught. Mixed drinks a specialty.” That was it. 959 Fifth Street, Two doors from the corner of D.
Headquarters for the San Diego Prima bottled and keg beer. Becker ran the Eintracht through 1912, then moved on to run other establishments. It obviously paid to advertise. In 1880 Warren and Frank Kimball, already big landowners in National City, Chula Vista and Jamul, found themselves owning the 4,400 acre Rancho Las Encinitas. They advertised the rancho for sale, and in 1884 they found a buyer in Theodore Pinther, a German immigrant then living in Denver who had an idea to develop a German-speaking colony in his new country. By June of 1884 twenty people had signed up as fee-paying members of the Colony of Olivenhain. The rancho land was purchased on October 3, 1884. On October 31, the colonists, by then totaling 67 men, women and children, boarded a train in Denver and headed west. It turned out that conditions on the rancho were not quite what the colonists had been led to expect. Promotional brochures had promised the immigrants a rich, well-watered soil that was already yielding an abundance of olives. The reality was quite different. There were other revelations too, such as overcharges on land prices, secret sales commissions paid to Pinther by the Kimball brothers, and other provisions of a contract originally written in English and only provided in German translation at the demand of increasingly irate colonists. Pinther and another leader were literally forced to leave the community and the colonists demanded a new contract from the Kimball brothers. A team of arbitrators, including banker Jacob Gruendike, were brought in, and a new deal was negotiated. The article was reporting on an analysis of county beet crops for sugar content. The analysis was conducted by by J. D. Spreckels, who knew something about sugar. Sources for this post included historic San Diego newspapers, the website of the Olivenhain Town Council, http://www.olivenhain.org/ , Leland Fetzer’s 2005 book, San Diego County Place Names A to Z, and the 1890 book, Illustrated History of Southern California, by the Lewis Publishing Company. From the “Poway Points” column in the Poway Progress newspaper, March 23, 1895. Thomas Jerome Cambron was a busy man indeed. He’d been farming and raising livestock in the Poway Valley since arriving from Illinois around 1873. By the 1890s he was farming some 300 acres and apparently doing pretty well. Early in 1895, Cambron was appointed a roadmaster. The San Diego County government appointed local citizens to do road maintenance in unincorporated communities. Remember, at that time the Poway Valley and its immediate environs were still considered “the back country.” Locals were hired and paid a nominal wage to grade and clear the then-unpaved roads. “T. J. Cambron and A Danielson have repaired the worst break in the road to Stowe, an improvement which is appreciated by the mail carrier on that route,” read an account in the Progress of August 3, 1895. He also managed to find the time to participate in the civic life of his community. “T. J. Cambron and Adams Chapin have been named as deputy county clerks in this township,” announced the “Poway Notes” column in the San Diego Union of January 29, 1903.Cambron’s name also appears in jury lists and as a polling official in Poway during elections. He wasn’t as well known as some other San Diego pioneers, but he certainly did his civic duty, while also tending a farm and raising two children with his wife Martha. Here’s to Good Citizen T. J. Cambron! 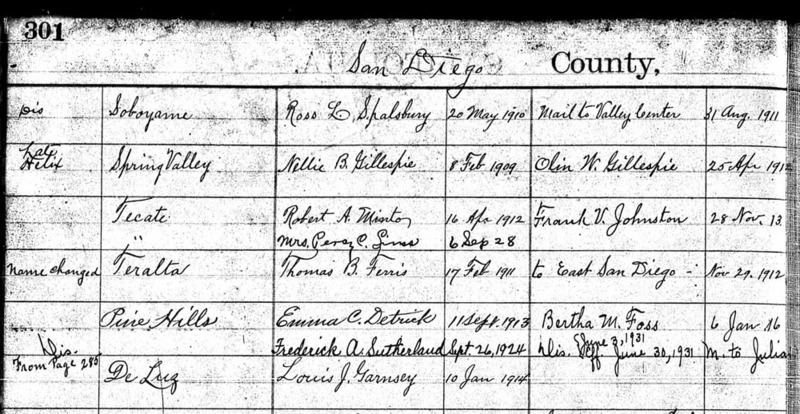 Sources for this post included historic Poway and San Diego newspapers, the 1880 and 1900 U. S. Censuses, and the archives of the Poway Historical and Memorial Society. “The New Mill at Pala,” was the subject of an extensive article in the San Diego Sun on December 28, 1881. Gristmills, or flour mills, were places where farmers brought their crops of wheat, corn or barley to be ground into flour. They were an essential part of the agricultural economy in San Diego County at that time. The Sickler Brothers Mill was the first in the county. The Sickler brothers knew their business. Two large grinding stones, built in France, were shipped from Missouri—where the Sickler family had formally lived and operated a mill—to Oceanside and then hauled to Pala by wagon. The brothers built a flume to divert water from the San Luis Rey River, carrying it down a twenty foot drop to the mill. There the force of the water drove a cast iron wheel, just under 6 feet in diameter, its surface studded with large buckets or paddles. The milling process was time-consuming. Since it was the only mill in the area and the only way to bring crops there was by horse-drawn wagon, it often took several days to get to and from the mill, and once there “people had to wait from several days to several weeks to get their crop processed,” according to a 2005 report published by the San Diego County Department of Parks and Recreation. The mill became a community gathering place, with farmers and their families camping out for two weeks or more, “sharing stories and recipes, and trading goods,” the report stated. The Sicklers even set up a makeshift school for farm children. The mill operated successfully for about a decade. Then as railroad service in the county became more developed, it became easier and cheaper for farmers to transport their crops for processing in Los Angeles and elsewhere. Today the mill site is part of the Wilderness Gardens Preserve, maintained by the Parks and Recreation Department and open to the public. The tall wooden mill structure is gone, but its stone foundation remains, along with the cast iron water wheel which sits alongside it. For further information, visit http://www.sandiegocounty.gov/parks/openspace/wildernessgardens.html . Sources for this post included historic San Diego newspapers and the archives of the San Diego County Parks and Recreation Department, with special thanks for the work of Lynne Newell Christenson, former San Diego County Historian, Ellen Sweet, Volunteer Researcher at the Parks Department’s History Office, and Department District Manager Jake Enriquez.